This is the story of a boy, a girl, some dirt and a dream. When I met Charlie Hughes in 1997, he was selling his pottery at a show where I was also vending. He had studied ceramics at Penn State University and was now peddling his wares on the road, trying to make a living in the clay biz. I was a self-taught stained glass artist, and selling at art shows was a very occasional thing for me. We quickly became good friends (and I became a dedicated customer), and over the years a long and strange romance ensued. I proposed to Charlie in 2007 in the very same spot we met all those years ago and we married in the summer (and twice in the fall) of 2008. That's our summer wedding picture over there on the right! I never thought I'd have the aptitude for clay work, but Charlie patiently taught me "the way of the clay" and now I'm a potter too...and we've been happily covered in mud together ever since! We honestly love what we do, and are truly blessed to be able to make a living doing what we love. Even after all these years we race down to the studio, like kids on Christmas morning, to peek into our cooling kilns. 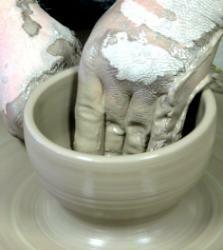 We are, quite frankly, addicted to clay! And our business isn't just about selling people some mugs; it's about making beautiful things that become a small part of our customer's lives. We love to hear that our customers have to use "our special mug" for coffee each morning, or that our teapot graces the table at every family gathering. 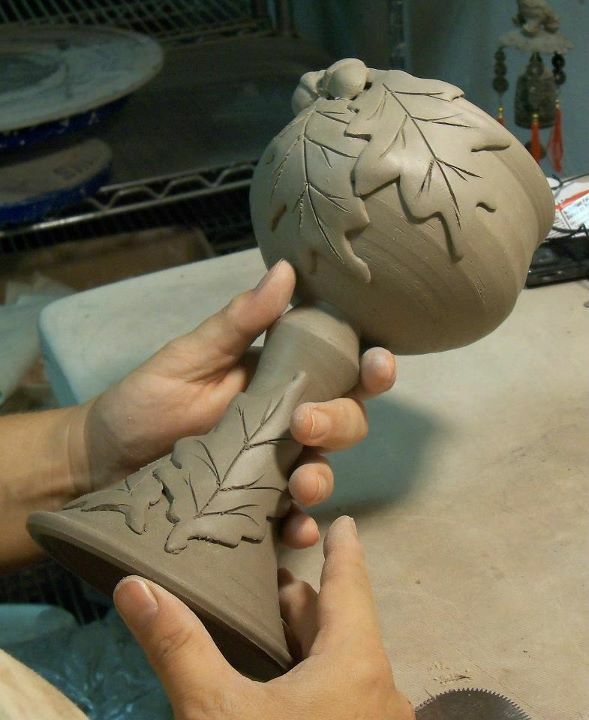 To find out more about how our pottery is made, check out the How It's Made page for pictures and videos of our process.